Product Consist: Bouquet of 10 Pink Roses in a cellophane wrapping, Teddy Bear (Size: 6 inch) along with 16 pcs of Ferrero Rocher Chocolate. You should not miss out on this gift combo when shopping for near and dear ones this festive season. 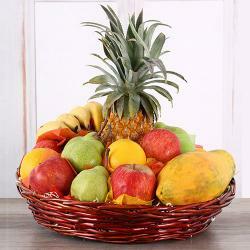 This gift combo certainly promises to be a wonderful acquisition for special occasions like Diwali, Anniversary, Weddings, Congratulations, Baby Shower, Daughters Day and many more. 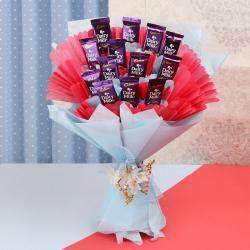 This includes Elegance of fresh flowers bouquet of pink roses with teddy bear and sweetness of ferrero rocher chocolate is the perfect way to express your feelings by gifting this lovely hamper to your very special ones. 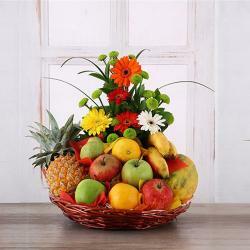 Thus, send this alluring Gift to India through Giftacrossindia and make your recipient feel extra special. Product Includes: Bouquet of 10 Pink Roses in a cellophane wrapping, Teddy Bear (Size: 6 inch) along with 16 pcs of Ferrero Rocher Chocolate.